There are, alas! many blind men, who practise their castigation, whether it be fasting, watching or labor, only because they think these are good works, intending by them to gain much merit. Far blinder still are they who measure their fasting not only by the quantity or duration, as these do, but also by the nature of the food, thinking that it is of far greater worth if they do not eat meat, eggs or butter. Beyond these are those who fast according to the days; one fasting on Wednesday, another on Saturday, and so on. These all seek in their fasting nothing beyond the work itself: when they have performed that, they think they have done a good work. I will here say nothing of the fact that some fast in such a way that they none the less drink themselves full; some fast by eating fish and other foods so lavishly that they would come much nearer to fasting if they ate meat, eggs and butter, and by so doing would obtain far better results from their fasting. 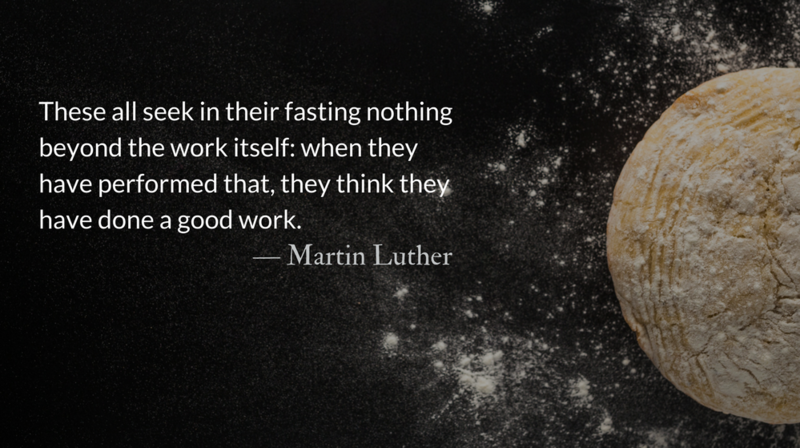 For such fasting is not fasting, but a mockery of fasting and of God. Therefore I allow everyone to choose his day, food and quantity for fasting, as he will, on condition that he do not stop with that, but have regard to his flesh; let him put upon it fasting, watching and labor according to its lust and wantonness. – Prayer from The Divine Hours: Prayers for Springtime by Phyllis Tickle. Full prayer available online and in print.